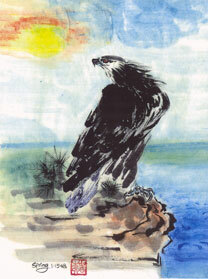 Home / "Bald Eagles," Prints, 8" x 11"
The following are my Chinese brush painting of bald eagles. Eagle is a large and powerful bird of prey with a hooked bill and broad wing span that hunts by day and is noted for its keen eyesight and majestic soaring flight. The bald eagle, a large North American eagle, found mainly near lakes and rivers, the adult of which has a white head and tail. 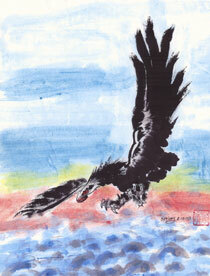 An image of the bald eagle is used as an emblem of the United States of America. 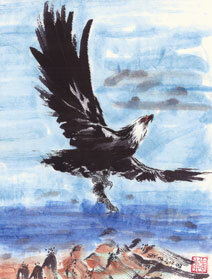 People often describe their first bald eagle sighting as breathtaking, even unforgettable. So, don’t miss out on experiencing the majestic beauty of the magnificent bird.